Essentials for Business Recruitment & Retention. 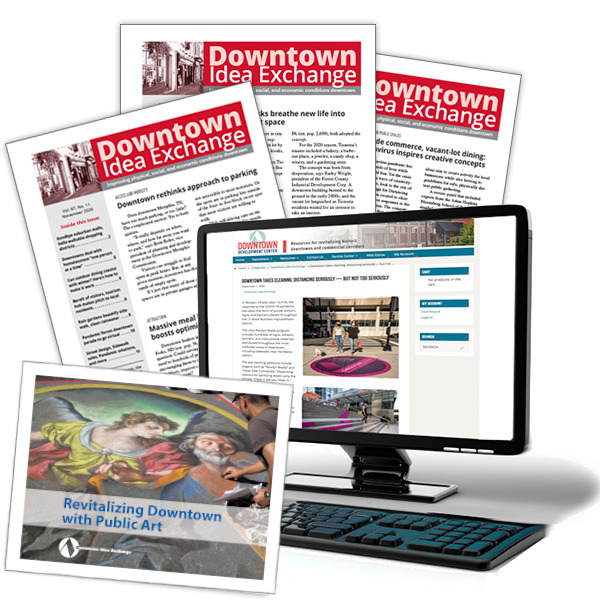 Each month downtown leaders turn to Downtown Idea Exchange for practical news reports, how-to information, and hundreds of real-world examples of how downtowns are growing and prospering. By focusing on examples and experience, by looking for evidence of what works, and by presenting material in a concise and conversational format, Downtown Idea Exchange connects readers with downtown professionals from other communities who are dealing with similar issues. You’ll learn how cities and towns of all sizes are tackling tough challenges like business recruitment and retention, funding downtown improvements, building support for investment in downtown, improving walkability, creating a more inviting physical environment, activating public spaces, increasing the economic base, and more. You’ll learn what they are doing and why, and we’ll point you in the direction of additional resources for more in-depth reading and research, or for informal conversations with colleagues. The monthly print newsletter is supplemented with online content including Web Extras and the special report, Essentials for Business Recruitment & Retention. Subscribe today and start this valuable resource working for your downtown now. You’ll receive valuable background material, additional information, and related resources that we just can’t fit in the print newsletter. You’ll have access to these materials in the Web Extras section of the website. With your subscription, you’ll receive Essentials for Business Recruitment & Retention. This special report brings you a detailed checklist along with dozens of case studies showing how downtown leaders are strengthening at-risk businesses and bring the best new businesses downtown. If you are ever dissatisfied, just let us know. We will promptly refund the full subscription price. The newsletters and welcome gift you have received are yours to keep. Click for easy order and payment details.